You must specify an available repository before it is possible to share the project with others. Open the CVS Repository Exploring perspective. The top left view shows all of the CVS repositories that are currently being worked with. As you can see, the view is empty, meaning a repository still needs to be specified. In the context menu of the CVS Repositories view choose New > Repository Location. 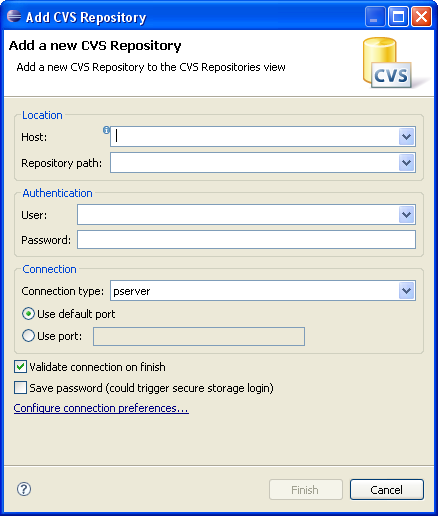 In the CVS Repository Location wizard, the location of the repository and the login information needs to be filled in. You may need assistance from a repository administrator in order to fill in the necessary information. In the Host field, type the address of the host (for example, "teamsamples.com"). In the Repository path field, type the path for the repository at the host address (for example, "/home/cvsroot/repositoryName"). In the User field, type the user name under which to connect. In the Connection type field, select the type of CVS connection for the repository (The default is pserver). Leave Use Default Port enabled. By default the Validate Connection on Finish option is checked. Since Validate location on finish was checked, the wizard will now attempt to validate the information by connecting to the repository. In doing so it may prompt for a password. Note: The repository connection is only used to validate the information. Observe that the CVS Repositories view now shows the new repository location.